National Football League team owners met this week in Dallas to discuss, among other issues, whether to move the San Diego Chargers or another team to the Los Angeles area. No final decisions on relocation were made at the gathering, in which the L.A. relocation effort was one of several topics on the agenda. However, ESPN reported that the owners could move the application period for teams wanting to relocate from the traditional Jan. 1-Feb. 15 window to March or even May, which could prevent a team from setting up shop in a new city for the 2016 season. Other reports said the owners could firm up plans for a special meeting next month in Houston, where a vote on relocation could be taken. 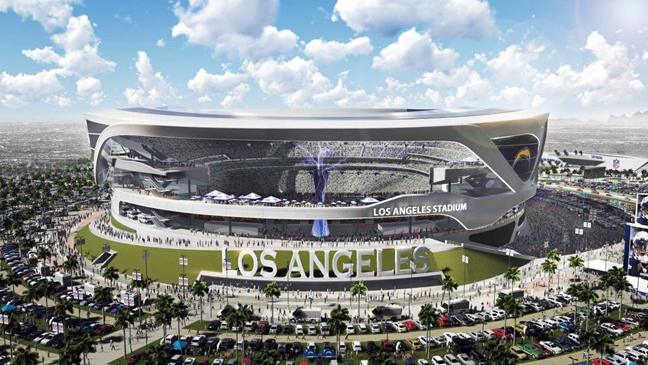 The owners of the Chargers, Oakland Raiders and St. Louis Rams have all expressed interest in moving to Los Angeles. The Chargers have been asking for a replacement for aging Qualcomm Stadium for nearly 15 years and have acquired land in Carson in Los Angeles County where they could build a facility perhaps in concert with the Raiders. The city and county of San Diego have proposed building a stadium in Mission Valley, but there have been no negotiations with the team since June because of a dispute over the way an environmental study was conducted. While no substantial plan has been put forth to keep the Raiders in Oakland, officials in St. Louis and the state of Missouri are trying to keep the Rams from leaving. NFL executives have described that plan as being further along the process than what’s been offered by San Diego. Rams owner Stan Kroenke, who met with St. Louis officials on November 30 to get clarification on their proposal, wants to build a stadium for his team in Inglewood, near Los Angeles International Airport. It will be up to the owners to decide which team, if any, will go to Los Angeles — which has been without an NFL franchise for more than 20 years. The meeting took place one day after the city of San Diego released its response to concerns league executives had with a term sheet for a Mission Valley stadium project proposed by the city and county two months ago. Among other things, the response from city/county consultant Chris Melvin told the NFL that a public vote on a proposed stadium project would be likely to pass thanks to Mayor Kevin Faulconer’s strong approval ratings, as long as it included the backing of regional leaders and the Chargers. Among other matters raised by the NFL, Melvin wrote that any litigation involving an environmental study for a proposed stadium site near existing Qualcomm Stadium would be resolved by the end of next year, that the city and county have strong credit ratings, and that any impact of a separate initiative that could shift a stadium project to downtown would be mitigated if the Chargers were in opposition. The NFL also expressed concerns about a lack of financial details in the term sheet. Melvin wrote that the intention was to negotiate the specifics, but he did provide a framework regarding rent, ticket surcharges and parking fees.